It's been quite a while that I did not patronise the hawker stalls at Jalan Tengah. I used to stay nearby there and I could remember that most of the time I will visit the hawker centre and had my breakfast, lunch or dinner there. But after since I moved many years back, I hardly went there for any meals. Recently, I noticed that there are some new stalls operating in the hawker centre. So we decided to give it a try to some of the new stalls. There are still some existing stalls there. Like the "Mee Jawa" stall. But mainly I will blog about new stalls. 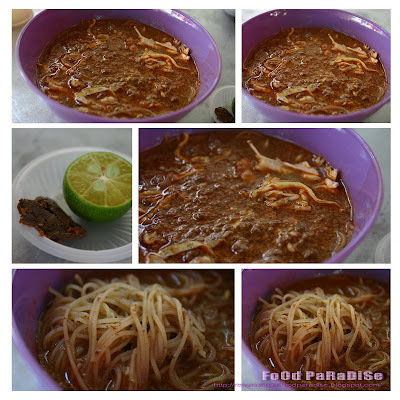 The first stall is the newly operated stall which sell "Sarawak Laksa" and "Sarawak Kam Pua". I hardly spot this stall as since it is new and not much people knew about this stall. I only spotted this after I ordered some other foods. But we went back again to try out the foods the next trip. The "Sarawak Laksa" is only available on Sunday only. 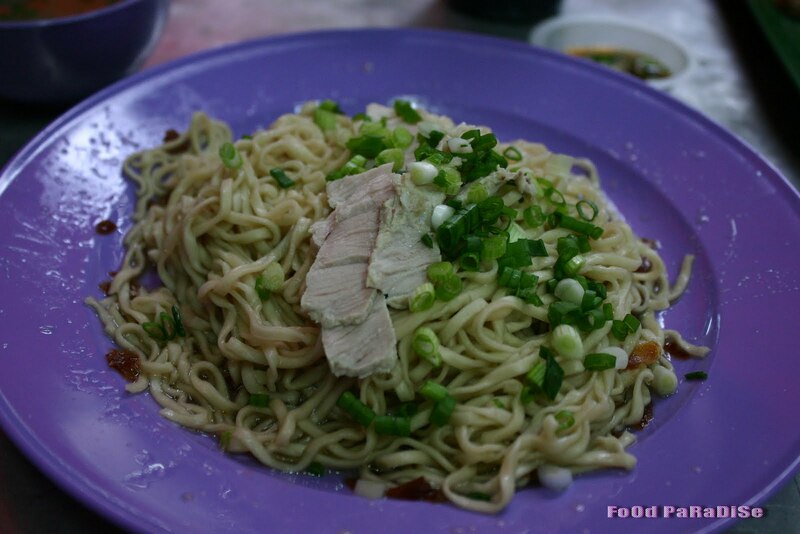 Well, if you missed "Sarawak Kolok Mee" perhaps you can give this stall a try. The taste is quite similar. The noodles is cook to perfect timing as it is not too soft. As I hate soft noodles. I like the springy textures of the noodle. 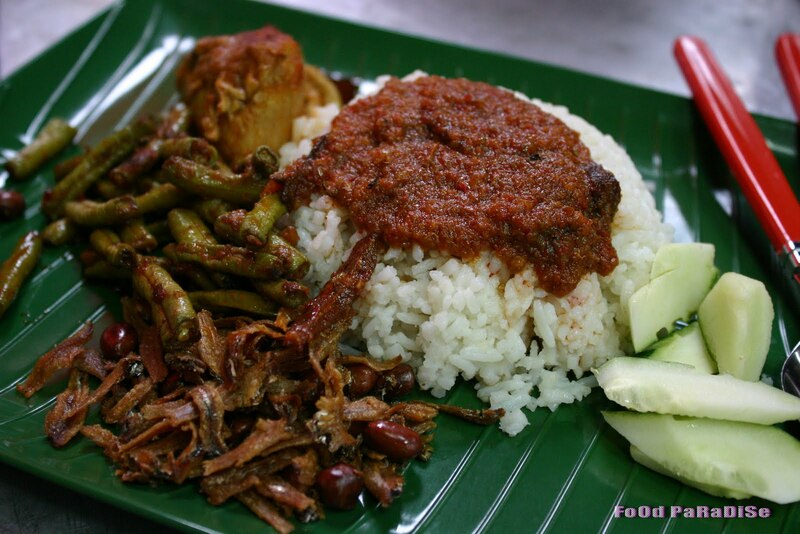 This Kam Pua cost RM3 per plate which compares to Sarawak with this money, there will have more toppings like minced pork, fish ball and...... added on. But here they just use few pieces of pork slice. 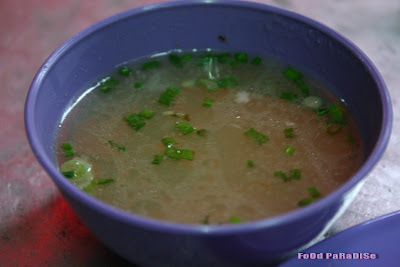 The soup is just a clear soup but I can taste that the owner of the stall has added some "Foochow Red Wine" in there and make the soup a bit different. Hubby and my sil went to try the nasi lemak stall. There are few choices of dishes to choose from. 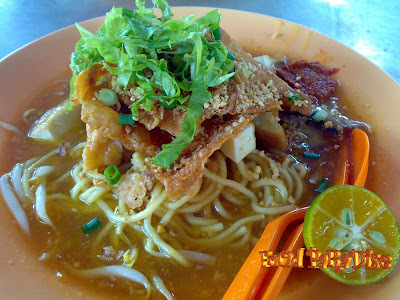 This stall sell two different kinds of mee Jawa. One is Mee Jawa Rebus and another one is stir fry mee jawa. I always opt for the Mee Jawa Rebus. As I love the sauces that make by this stall and also the crunchiest tops and the peanut coating. This stall sells different kinds of friend rice. I found that when you dined in there, there are more fried rice than take away. ^.^ So far I have try 3 different kinds of fried rice from this stall. The Pattaya friend rice is not bad. But it is not done in the traditional ways that they wrap the rice in the egg. The egg was just served and covered on top. But the rice tasted not bad. If you want to opt for something more spicy. Then you can try the Chiang Mai Fried Rice. This is my gal favourites fried rice so far. And she never failed to finish it. She will always finish this plate of pineapple fried rice in no time. But she will omit the sultanas. She just doesn't like to take sultanas. She is an odd little gal as most kids love sultanas very much. ^.^ She loves the pineapples and the turmeric aroma.